The HOT ROD Power Tour presented by Chevrolet Performance and driven by Continental Tire will be celebrating 25 years in 2019 and once again rolling through the heartland of hot rod culture with stops at Lucas Oil Raceway in Indianapolis on Wednesday, June 12th, 2019. The highly anticipated seven-day, seven-city journey is expected to bring together more than 6,000 vehicles and 100,000-plus spectators, June 8-14, 2019. Registration is now open. For more information, visit hotrod.com/events. More than just a traveling car show, HOT ROD Power Tour is the largest hot rod road trip in the world. Classic cars and hot rods travel city to city, over 1,300 miles, enjoying the people and stops along the way. Presented by Chevrolet Performance, HOT ROD Power Tour is widely considered to be the finest high-end hot rod–based automotive tour in the world, as performance car lovers join HOT ROD editors and photographers cruising through small town America. 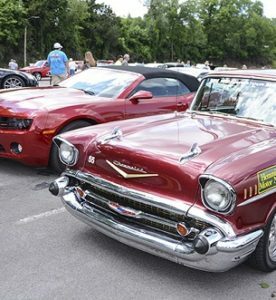 HOT ROD Power Tour welcomes all makes and models of hot rods, street rods, custom trucks, muscle cars, and performance machines of every vintage and nameplate. For many, HOT ROD Power Tour is the ultimate vacation with friends and family. Those who travel from start to finish are considered the “Long Haulers,” a title they proudly boast. The 2019 HOT ROD Power Tour anticipates more than 5,000 “Long Haulers” on tour. At each stop, the 25th annual HOT ROD Power Tour will feature a colorful midway of mobile display rigs from more than 50 performance manufacturers and aftermarket specialists with opportunities to view the latest innovations and get expert advice. The main stage will feature entertainment, live music, celebrities, games, and dozens of giveaways. Select locations will also feature dragstrip fun runs and autocross action. As HOT ROD Power Tour’s official travel partner, Anthony Travel can assist with travel and hotel arrangements. Visit Anthony Travel’s HOT ROD Power Tour website at www.anthonytravel.com/hot-rod-power-tour to get started on booking your trip. If you have questions, contact Anthony Travel at motortrend@anthonytravel.com or call 844-406-6850. Spectators can come out and witness the HOT ROD Power Tour spectacle at no gate admission cost and enjoy FREE parking at all venues. Participants may register a vehicle for just one day, two days, or for the best value the entire event as a “Long Hauler.” Vehicle registration is open to any year, make, or model. Registration is now open at hotrod.com. For more information, follow HOT ROD Power Tour at hotrod.com; Facebook: facebook.com/hotrodmag; Twitter: twitter.com/hotrodmagazine; email powertour@hotrod.com.